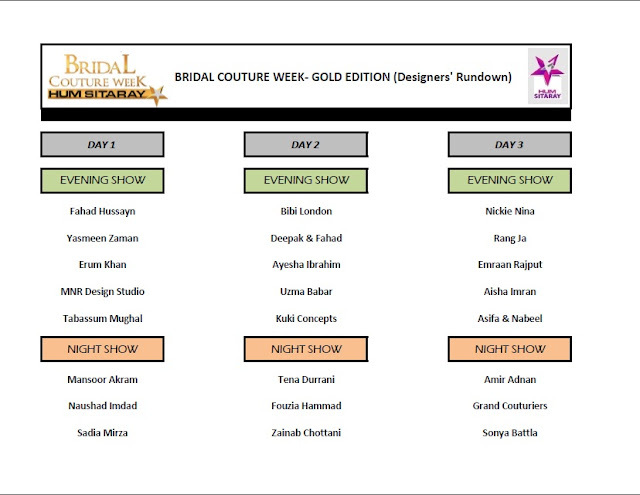 Press Release: Bridal Couture Week Gold Edition Schedule and Details...!!! 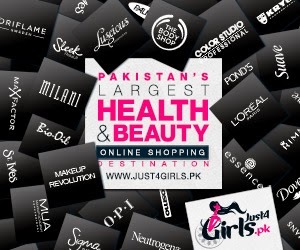 Pakistan’s numero uno general entertainment network HUM Network Limited is pleased to announce the names of participating designers, makeup artist, models and choreographer in the 12th edition of its most anticipated fashion event, Bridal Couture Week – Gold Edition. Slated to take from May 6 to May 8 2016, the Gold Edition of Pakistan’s biggest bridal extravaganza will showcase latest bridal collections of the country’s 22 leading and emerging designers. The Gold Edition of BCW will also present Bibi London featuring Neeta Lulla and Tarun Tahiliani’s latest collections and the Grand Couturiers segment will feature prominent names of our industry including Umer Sayeed, Shamaeel Ansari, House of Kamiar Rokni, Elan, Sania Maskatiya, Zarah Shahjahan, Nida Azwer & Shehrzad Rehmatoola. The designer line-up includes Amir Adnan, Aisha Imran, Asifa & Nabeel, Amina Yasmeen by Mansoor Akram, Ayesha Ibrahim, Deepak & Fahad, Emran Rajput, Fahad Hussayn, Goal by Fouzia Hammad, Hamna Aamir, Kuki Concepts, MNR Design Studio, Naushad Imdad, Nickie Nina, Rang Ja, Sadia Mirza, Sonya Batla, Tabassum Mughal, Tena Durrani, Umsha by Uzma Babar, Yasmeen Zaman and Zainab Chottani. N-Pro and N-Gents will be grooming 58 male and female models over the course of three days along with a long list of showstoppers to walk the ramp this season. #BCWGold will also present 4 international models to walk the ramp this year. The Gold Edition of BCW will be choreographed by the ace choreographer Ketan Bhatia from New Delhi, India and the action will be captured by Haris Usmani, Ahsan Qureshy and Kashif Rashid. All public relations operations and media liaison will be carried out by the in-house PR team of HUM Network Limited along with BodyBeat PR & Events. Press Release: Outfitters Mid Summer Sale...!!! 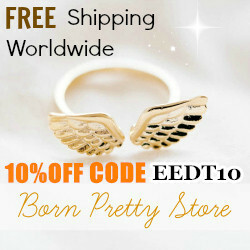 Mothers Day with The Body Shop...!!! 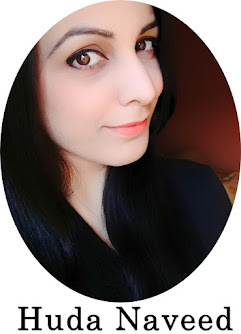 Review: Keune Hair Care Products...!! !